Big Agriculture has targeted Africa with GMOs. Monsanto and friends, with USAID, are targeting several African countries as insertion points, and Ghana is one of these. Their plan for Ghana is described here: G8 Cooperation Framework to Support The “New Alliance for Food Security and Nutrition” In Ghana PDF, also known as the G8NA. If you read it there is lots of flowery language about helping smallholder farmers and women. The program it spells out does exactly the opposite and will destroy lives and livelihoods. The G8NA works with the Comprehensive Africa Agriculture Development Program CAADP. CAADP has a highly questionable approach to food security and nutrition. The problems with CAADP and with G8NA are spelled out in Do African Farmers Need CAADP? a brief and clearly written pamphlet explaining the issues involved, a PDF version can be downloaded at the link. In order to protect the patents and monopolies of Big Ag, the corporations need countries to pass 3 laws: a biosafety law letting GMOS into the country, a seed law that regulates and defines seeds so that only the seeds produced by the big agro-chemical companies meet the legal requirements for use and sale, and a UPOV-91 compliant Plant Breeders Bill, which is a trade agreement. Like many contemporary trade agreements it is less about trade and more about putting the “rights” of corporations above the laws of nations. USAID shepherded a seed law and a Biosafety Act through the Ghana Parliament and got them ratified into law before the citizens of Ghana realized what was going on. However, when the information started getting out people caught on fast. 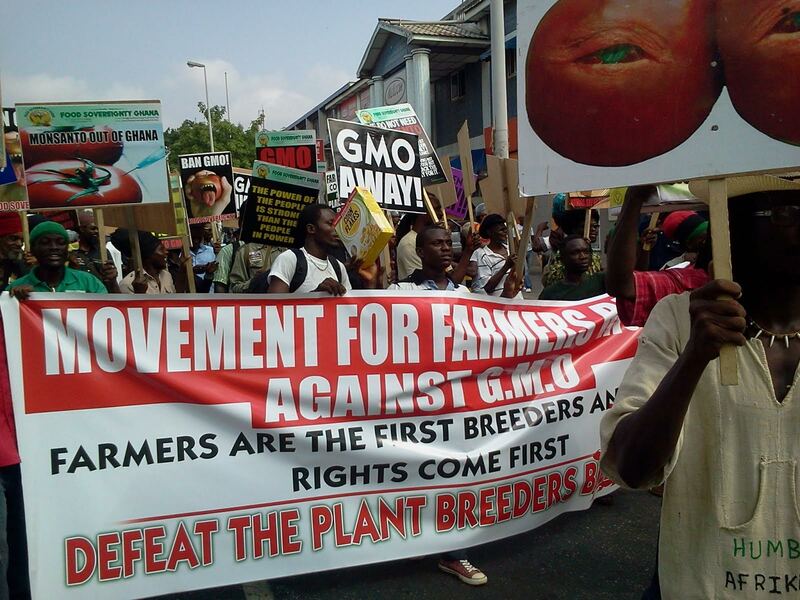 A number of farmers groups and civil society organizations have petitioned Parliament, marched, and declared their opposition to the Plant Breeders Bill and to GMOs in Ghana. Interviews with MPs indicate they really don’t know what is in the bill and have been told a number of lies. I have been doing some research and work behind the scenes for Food Sovereignty Ghana, which is a leader in the fight against the Plant Breeders Bill, against GMOs in Ghana, and for an agroecological approach to farming in Ghana. That is why I haven’t been blogging through this last year. The Plant Breeders Bill, PBB, declares “A plant breeder right shall be independent of any measure taken by the Republic to regulate within Ghana the production, certification and marketing of material of a variety or the importation or exportation of the material.” This puts the plant breeders above the laws of Ghana, and beyond the ability of Ghana to protect her citizens in the future from any adverse effects of the plant breeders products. The PBB specifies GMOs as one of the varieties protected by the bill. It also allows the plant breeders to operate from outside the country and allows them to steal and patent for themselves the DNA of the seeds and plants that Ghanaian plant breeders have been developing over centuries. They can steal Ghana’s DNA and then sell it back. The following is an article released by Food Sovereignty Ghana and published in a variety of sources throughout Ghana, Africa, and globally. BAN ALL GM FOODS IN GHANA! Food Sovereignty Ghana calls for an indefinite Moratorium or ban on the propagation, cultivation, raising, and growing of Genetically Modified Organisms in Ghana. We call for a total ban on everything GMO, including but not limited to, the introduction into the environment, contained and confined use or field trials, import, export, GMO in transit, or placement on the market. We demand that this ban be put in place until the science of GM foods and human health, as well as environmental impact, has been thoroughly studied and cleared as safe by independent science rather than corporate-driven, profit-oriented scientists and regulators, ridden with conflicts-of-interest. There is a gigantic global attempt to impose GMOs into our food chain through deals made by transnational agribusiness corporations with our political elites, designed to limit public awareness and exclude public participation. The collusion between the biotech industry and politicians and regulators makes nonsense of their assurances that GM foods are safe. Even if the highly questionable claims of increases in food or crop yields, or drought-resistant flood-resistant GM crops were true, the ever increasing amounts of pesticide toxins they contain should prohibit their production or use. Toxic food, regardless of abundance, does not replace safe and edible food. GMOs contain massive quantities of pesticides, a huge health threat. Close to 100% of all commercial GMO crops are genetically engineered to contain pesticides, or to absorb huge amounts of pesticides without being killed. When we consume the plants, or eat animals that consume the plants, we consume those pesticides that can injure heart, lungs, nerves, digestion, blood, skin, immunity, and sexual function and development. Genetically engineered Bt Crops are engineered to express (produce) the Bt toxin in its active form,. The active toxin is produced in every individual cell of the crops, thus making the entire crop a pesticide. When you eat a genetically modified Bt food crop you are eating pesticides. Bt crops are regulated by the US Environmental Protection Agency (EPA) as pesticides (EPA document 735-F-02-013 May 2002). Promoters of GM foods downplay but it does not change the fact that Bt is a pesticide. This is common sense but unfortunately some people are trying so hard to prevent us from thinking for ourselves. Vast quantities of GMO crops are herbicide resistant crops. These are grown both for human and for animal consumption. These crops are genetically engineered to absorb massive doses of pesticides that kill weeds, chemicals that are sprayed on the crops repeatedly, sometimes as many as 300 days out of the year. These chemicals are in fact chemical cocktails and include adjuvant chemicals designed to penetrate the plants and cause them to absorb even more of the pesticidal toxins. The adjuvant chemicals, close to 400 of them, are never tested. Testing is not required by law. How safe they are, or what they do when they enter our bodies is anybody’s guess. The American Academy of Environmental Medicine, the Doctors who understand, study and follow the effects of environmental factors on our health, issued a statement in 2009, on the dangers of GM food and advised all their members to prescribe non GM foods to their patients. Just last week, we saw in the news, a call by Lieutenant General Mi Zhen-yu, former vice president of the Chinese Academy of Military Science, on the Chinese government to“face up to reality” about the harm from genetically modified food. The General provides specific numbers on the increases in birth defects, severe depression, precocious puberty in girls, autism, childhood cancers, male sperm quality and infertility, Parkinson’s disease, cardiovascular disease, diabetes and chronic kidney disease. “The situation is shocking.” Why are those who claim GMOs are safe are opposed to any long-term independent studies in toxicity? Why are they against labelling? GMOs, and the legal framework that permits and sustains them, are not business as usual but an orchestrated attempt to control our food, our land, our water. GMOs and their legal framework offer foreign corporations permanent control over our destiny as individuals and as a nation. These laws, the Biosafety Act, Seed Laws, and UPOV laws such as the Plant Breeders Bill are sometimes referred to as weapons of legal destruction. They place corporate interests and greed above the laws of nations. They leave the entire budgets of nations vulnerable to corporate whims. Considering recent revelations that Parliamentarians take bribes, the glaring absence of even a minimum code of conduct for Parliamentarians regarding lobbying, and the mischievous and untenable attempts by the Attorney-General and Minister of Justice to impose UPOV on Ghanaians under the guise of meeting WTO requirements although UPOV law such as the current PBB is clearly not required by the WTO, we have every right to lose faith in them. We humbly call on the Mahama administration to cease all advocacy for GMOs and their legal framework, until the science of GM technology has been cleared by independent science. That will take awhile, as currently the agribusiness companies that own the GMO patents do not permit independent scientific testing, they ask us to trust what they tell us about the testing they conduct. Technology currently exists that is developing drought-resistant, pest resistant and high yielding crops through traditional breeding and selection. Marker Assisted Agro-ecological farming is not only inexpensive, and sustainable, it is far more successful than GM technology. Agroecological techniques are already safely and inexpensively producing crops with increasing yields plus tolerance and resistance to environmental stressors. We should forget GMOs and concentrate on agroecological agriculture. The only reason why our “development partners” are opposed to this is because their multinational corporations shall lose the attempts to monopolize our food through GMO patents. They see our agricultural wealth as raw material to be extracted from Ghana in order to power their economic engine. We need to control and develop our agricultural wealth to power Ghana’s economic engine. For Life, The Environment, and Social Justice!